Here you can read about our natural farming philosophy, what techniques we utilize to make natural farming work, and how we examine the result of effectiveness of natural farming. The most effective way of natural farming is to do nothing and let nature take care of the farm and plants. This is our ultimate goal, but to reach that goal there are much to be done so we’ll look at some of the things we do to get us closer to that ultimate goal. While working toward reaching the natural farming goal, we can choose to do our work in certian ways whether to use fertilizers, compost or plants to add soil fertility, tractor or hand tools to prepare soil, plant and harvest. We believe that natural farming is a philosophy of conforming to natural system and it is the philosophy that guides us to adapt unique regional soil condition and local environment and this natural condition requires us to formulate certain techniques through humble and unbiased observation. Fundamentally, natural farming utilizes natural mechanisms to acheive goals though the process to acheive the goals are not necessarily perfect. Utilizing natual mechanisms lighten our workload while enhancing soil biological activities, making soil rich and creating more diverse and stable ecological system. So many people are attached to the idea of what is natural and they tend to focus too much on the process of natural-ness itself. The beginning stage is letting go of our bias of what we think is natural. Our first step before even preparing soil for planting is to examine soil condition and soil fertility. This is different from sending soil samples to a lab to get soil analysis. It is looking at natural environment and seeing what grows there and how natural vegetation and terrain create certain soil condition. General observation can give us a big picture of the field design. Which part of the field has good soil fertility and which part needs more? What terrain creates naturally ideal condition for tea, taro, bananas, citrus, etc.? Our observation also needs clear and humble minds to observe the natural environment as it is. Not what we think it is, or what books tell us how it should be in natural condition, but just the way it is. This will help us to look at nature the way it is. “Nature has so much to show us, but we just don’t know how to look at them” says Mr. Kimura, natural farming apple grower in Japan. Once the soil condition and vegetation type are examined, we will prepare fields for planting. Good drainage, soil moisture, soil aeration, wind pattern and sun exposure are taken into account when preparing soil for planting, but the biggest difference in natural farming is to use plants to improve the condition. Machines can be used initially to open up a new field, but typically hard pan, drainage and soil aeration problems come right back when heavy machinery is continued to be used. 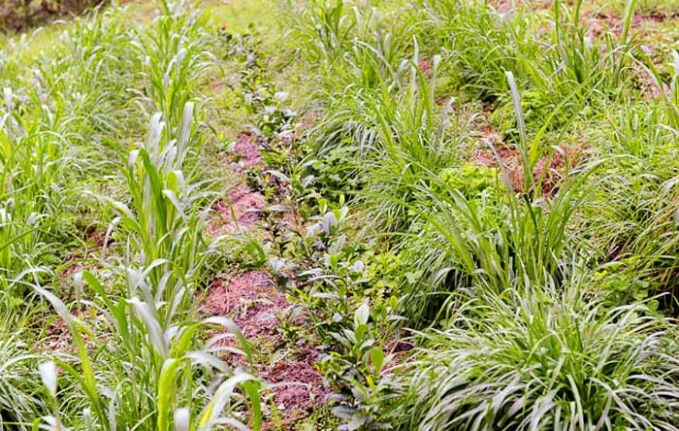 Use of cover crop or live plants can buffer the effect and even improve the soil condition. We use cover crops in many ways. Fertilizing the field, loosening the soil, adding organic matters, improving soil aeration and moisture retention, and providing shelter for insects and microorganisms can all be achieved by growing cover crops. Cover crops are plants or weeds that can achieve some of these feats just by being there and doing what they do. For example, alfalfa or clover are known for breaking up hard pan in the ground and increasing fertility in the soil. Many farmers use them as green manure to add extra nutrients to the soil, but we use cover crops to provide continuous food supply for various organisms. Over time this will create more stable environment for farm ecosystem. Certain cover crops are good at adding organic matter while others attracting beneficial insects, such as guinea grass can continuously add much organic matter to the soil from the roots and leaves, while clovers and buckwheat may attracts more beneficial insects. Mixing various plants will create more diverse environment and hold more diverse functions. In natural farming, Masanobu Fukuoka developed seedballs which consists of local soil, clay and various types of seeds. When rainy season arrives and the condition is right, seedballs melt and seeds germinate. Plants that can adapt the environment survive and flourish. We mix various types of locally thriving plants as well as prolific cover crop seeds. Ultimately nature will choose which plants grow in what condition. Thus mixing and spreading the seed mix without thinking too much help us understand nature’s intention of creating great ecological functions. We use various organic matters as raw as we can. Wood chips, grass clippings, unfinished compost, sometimes even large logs, we use them raw directly in the field. Less composted or processed they are, they have more energy and foods for microorganisms that digest and create the rich environment. On one extreme, many organic farmers spend so much time making compost, but it is literary waste of time and energy and creating greater CO2 pollution. Composting is basically many organisms breaking down organic matter by using O2 and releasing CO2. Finished compost is only good for providing nutrients to plants because most organisms die in the process and their dead bodies are used as nutrients. In nature nobody makes compost, but large forests and healthy plants are everywhere. When human grows plants, why do they get so much pest and disease problems? By using organic materials raw, it provides foods for microorganisms to digest and consequently other organisms can benefit from secondary and tertiary decomposition. What we are lacking in the fields are foods for these organism. Finished compost is wastes from organisms’ activities. We want to create high biological activity. If we can provide adequate soil environment and foods at the right timing, they will thrive and help us grow our crops. How about Indigenous Micro-Organisms (IMO) and Effective Microorganisms (EM)? In my experience with IMOs and EMs, they can be helpful if soil is in bad shape, but once the soil is improved, adding IMOs and EMs are just as wasteful as making compost. IMOs are indigenous microorganisms that are collected from local environment like forest, open field, and places where we likely to find them. I was obsessed once collecting all these IMOs from various forest types and under certain types of organic matter and culturing them in my own culture room, but once I saw the result and learned about how they can actually degrade the soil condition, I was actually a bit disappointed. IMOs can be good when soil is in poor condition or there is too much residual fertilizers or soil has tendency of rotting. EM or Effective Microorganisms can work similarly to IMOs, but sometimes more effective and more efficient since we know what the microorganis mix is. EM is a commercially cultured microorganisms originally collected from natural environment and formulated by Teruo Higa. In my experience, EM is especially good at removing rot layers in soil from residual fertilizers and preventing rotting of high protein fertilizers applied. I found that EM is more commercially viable to apply in larger scale, but also they tend to support certain other IMOs to flourish. After all IMOs and EMs are mostly microorganisms that break down protein (N), organic matter or OM (C) and some minerals with air (O2) and water (H2O). Simply put, what IMOs and EMs are doing is composting in various ways. IMOs and EMs are especially effective at absorbing minerals and recycling these minerals to crops. That means if we keep using IMOs and EMs without giving sufficient foods and minerals, they will start consuming last remaining OM or also called humus and minerals in the soil and deplete the soil and making it hard and poor condition. Just like feeding chickens or any live creatures, they need regular feeding cycle to stay alive (although we need not feed daily). From my work schedule and field size, I found that larger the field size is and more maintenance work I have to do, there is not much time to feed these IMOs. First response was not bad, but each consecutive response got worse and worse due to my feeding schedule. Although they can produce more, each time their stomach gets bigger and bigger like kids growing bigger. My realization was that use of IMOs and EMs were getting me further away from my goal of natural farming and what Mr Fukuoka describes, doing less work to get more done. The most noticeable difference is there are significantly less pests in natural farming field. Especially aphids and leaf roller. I had two separate fields, one with organic fertilizer and the other with no fertilizer, but the difference was obvious. Once I stopped applying organic fertilizer, the problem shifted and diminished over time. Increased biodiversity and biological richness can create more healthy environment with beneficial organisms occupying the field. While we find so many mycelia growing in our tea field and occasionally mushrooms pop out, it also seems to prevent other fungal diseases from affecting our tea.